Preferred type of aerial is affected by several factors, but mostly by transmitting site. In the middle of the area you want to cover you'll need an omnidirectional aerial which transmits equally all ways, while outside your coverage area you can beam the signal in with a directional aerial. Before going on air get a low VSWR by adjusting the position of the aerial and any of it's adjustable pieces. Aim for 2:1 or less. Use low power into the aerial when tuning it up and making adjustments. If you were using 100's of watts and a bit of the aerial came off in your hand the VSWR could be so bad as to blow the final transistor. For the same reason check the DC continuity of the aerial with an ohmmeter before plugging it in, to be sure it's what it's meant to be, either a short circuit or an open one, depending on the aerial type. A dipole shown below should be an open circuit. A PIECE OF WIRE OR TV ANTENNA ARE NOT ANTENNAS FOR MAX-1 OR ANY OTHER RADIO EXCITER! You have to realize that antenna was, is and will always be crucial part of the system. Special care has to be taken! It is usually good idea to place antenna away from your transmitter, power supply and audio system. If you cannot meet these requirements, you could experience feedback and other RF problems. Interestingly, RF energy can make CD players and other digital devices go bezerk. Try placing 30W-driven antenna next to yours. Note: A dipole needs a Balanced Feed as it is symmetrical, but a coaxial cable provides an Unbalanced Feed. 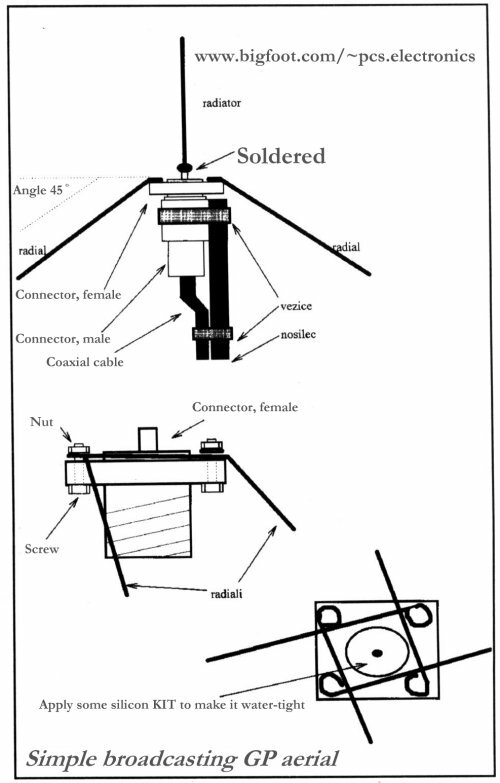 What's needed is a Balun (BALance to UNbalance) transformer. These can be made out of bits of coaxial cable. If you don't do this power will be radiated from the feeder. You CAN use it without BALUN, but you might get lower-than-expected performance and unusual radiation pattern due to interactions with the feeder. If you have SWR meter, leave a bit longer radiator and adjust it later by cutting to achieve minimum SWR. This is a vertically polarized omnidirectional aerial. We will publish a number of antenna designs here, these have all been submitted to our forum by our forum members, most notably NormB in his best days. A number of links is provided at the bottom, leading to design sources or other interesting resources regarding J-pole antenna construction. Some of the designs were made for 144MHz (2m ham band) and need to be scaled down for 100MHz operation. This usually means increasing element size for roughly 144/100 = 1.44 (44% increase). Precise manufacturing, excellent technical characteristics and no-tune wideband operation make this log-periodical aerial a recommended aerial for all FM MAX transmitters. Remember that this is a 6-element directional aerial, meaning it radiates most of the power in one direction, significantly boosting range in that direction. Check our antennas, the RLP0205 H or COMET from PCS Electronics (under Products in the left frame). Would you like to maintain our guides and become famous? Want to write exciting/usefully articles for others? http://www.pcs-electronics.com/information_contact_us.phpContact us with a bit of news about yourself today!